In a Time of Change: The Art of Fire is a visual art project designed generate excitement, facilitate mutual understanding and promote meaningful dialogue on issues related to fire science and society. The interaction between artists, fire managers and scientists can promote understanding and awareness of the scientific basis behind fire management practices in the context of Alaska's changing ecosystems. Nine local artists were invited to embrace the inspiration of wildfire, fire science and fire management to create a unique art exhibit. “In a Time of Change: The Art of Fire” is funded by the Joint Fire Science Program and was developed by the Alaska Fire Science Consortium (AFSC) and the Bonanza Creek Long Term Ecological Research Station (LTER). The work facilitates a sense of place, and helps to understand the functionality of fire in the ecosystems of Interior Alaska. Understanding that role is an important part of effective land management. The project brings together not just two perspectives on the subject but three: the management component unveils another layer of expertise and inspiration. The Bonanza Creek LTER formed the In a Time of Change (ITOC) network in 2007 with the goal of integrating scientific and artistic perceptions on our changing ecosystem, offering an exchange of perspectives from the arts, sciences and humanities and creating original work informed by that two-way exchange. Previous events included workshops and field trips, culminating similar events featuring visual, written and performance art in Fairbanks in recent years. This summary video was produced by AFSC coordinator Jen Northway for presentation at the Association for Fire Ecology 5th International Fire Ecology and Management Congress in Portland, Oregon, (Dec 3-7, 2012). It summarizes the Art of Fire project, including footage of field trips, the artwork, artist lectures, and news coverage. Sarah Trainor, PI for the Alaska Fire Science Consortium, also discusses The Art of Fire exhibit in this video on AFSC's approach. Four field trips were organized giving artists a behind-the-scenes look at what happens when a fire occurs, how scientific information is used in management decisions, and the many facets behind long-term ecological disturbance studies. The field trip element was structured for two-way exchange, allowing all participants to become immersed in the environment. 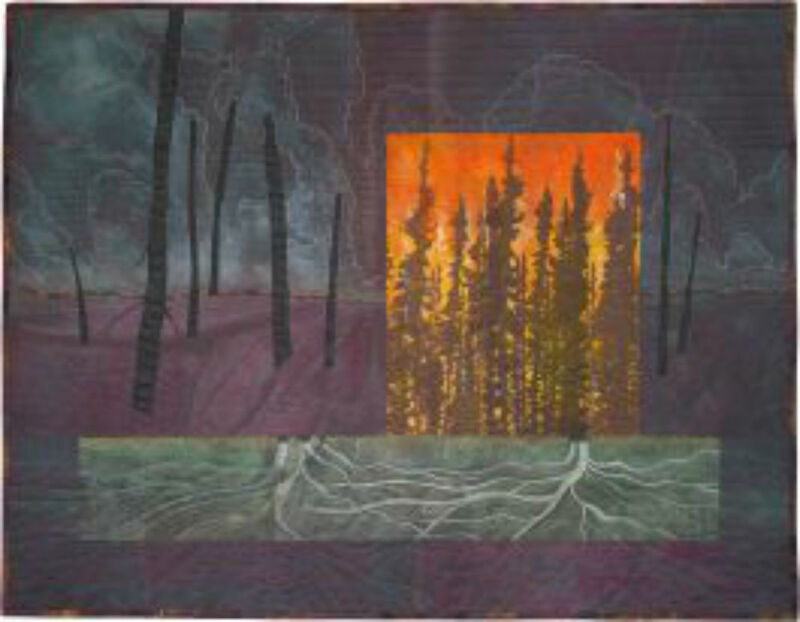 Nine local Alaskan artists were selected through a competitive proposal process to particiate in this visual art project, with the goal of integrating scientific and artistic perspectives on climate change in interior Alaska as it relates to fire, fire management practices, and the resulting changes to ecosystems. Each artist was tasked with completing a body of work (up to 10 pieces of visual art) based on inspiration from field trips, personal observations, and interactions with the science and management communities. The Alaska Public Lands Information Center hosted an evening lecture series that featured participating artists and local fire science researchers. The Art of Fire artists discussed the inspiration for their pieces, the experiences gained through field trips and their artistic process while Alaskan scientists focused on the ecological aspects of wildfire. 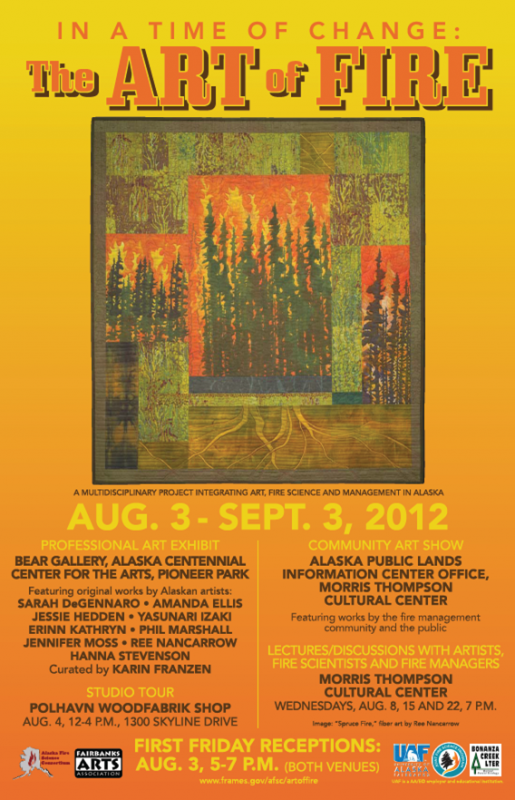 A portion of the Art of Fire works were exhibited at the Leah J Peterson Gallery at the Alaska Pacific University (APU) in Anchorage. The exhibit ran from January 4-27, 2013 at the APU Gallery. The culmination of this project was a formal art exhibit at the Bear Gallery, Alaska Centennial Center For The Arts, Pioneer Park. The nine artists unveiled their work on August 3rd with a First Friday Reception from 5-7 pm. Members of the fire management community and the public were also given an opportunity to share their wildfire experiences and observations through a Community Art Show. This show also opened on August 3rd with a First Friday Reception from 5-7 pm at the Alaska Public Lands Information Center, Morris Thompson Center. An additional selection of the Art of Fire works were selected for display at the National Science Foundation (NSF) headquarters in Virginia, as part of the Ecological Reflections – Sense of Place in Changing Places exhibit showcasing artist-scientist collaborations at LTER sites (Feb 28-Jun 15, 2013).